November 17, 2009 7:00 am By Lori Post contains sponsored/affiliate links and I get commissions for purchases made from links. As an Amazon Associate I earn from qualifying purchases. 1) Many times when companies are promoting a particular product, they use several promotional methods at once. For instance, they might have a high value coupon as one campaign, television ads as another, and travel/trial size products available as a third. Be on the lookout for special prices and smaller sizes to match with your coupon and maximize savings. 2) Manufacturer coupons are valid on clearance items. Be sure to check endcaps and clearance aisles to match up deals. 3) When a coupon like the one pictured below does not specify a product size, it can be used to purchase travel/trial size when available. Target and WalMart both have great travel size sections located near the hair care/mouth care/deodorant aisles. Matching up coupons to small sized products often yields freebies! 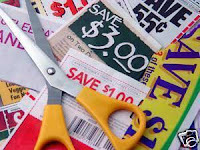 4) Printable coupons should only come from legit coupon sites like coupons.com, redplum.com, smartsource.com or from the manufacturers website. Most of the time, legit printables have a unique code on each one and usually are not found as a PDF document. Never use a PDF coupon unless it comes directly from the manufacturers website. 5) Photocopying printable coupons is considered coupon fraud. Be sure that printables are legit by checking for the unique codes and a clear barcode. Since some of the clarity is lost in the photocopying process, fakes will have blurred barcodes that probably wouldn’t scan at checkout. When in doubt, don’t use it. 6) The wording on a coupon is very important. 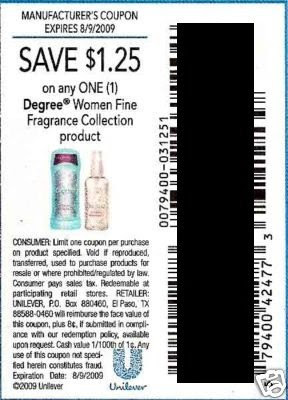 Some coupons will be valid on any product from a particular product line. For example, it might say “$1.00 off any Johnson & Johnson Baby Product”, but the product photo might be Johnson’s Bedtime Bath Wash. Be aware that the photo on the coupon is usually for the highest priced item in that product line, and normally does not limit the coupon usage. Because the wording of the coupon says, “any” product, you are able to use it on shampoo, powder, baby oil, trial sizes and of course, on any clearance items. 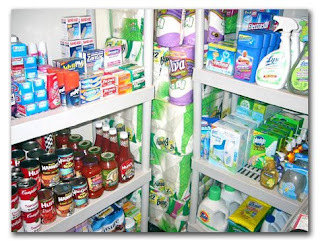 7) You will realize the most savings when you learn how to stockpile. November 10, 2009 10:37 am By Lori Post contains sponsored/affiliate links and I get commissions for purchases made from links. As an Amazon Associate I earn from qualifying purchases. I have a lot of coupons – and not a lot of time. So I’ve been looking for a *cute* and functional change from the typical coupon binder. I’ve found that it takes me too much time to fold the coupons to fit into the clear plastic holders, and I don’t have the patience!!! cut them out, and glued them on. Voila! If you’re really creative, you could even decorate the box! November 10, 2009 7:00 am By Lori Post contains sponsored/affiliate links and I get commissions for purchases made from links. As an Amazon Associate I earn from qualifying purchases. In the couponing world, the term stockpiling is used to refer to stocking up on products that are free or nearly free after coupons/sales. In a relatively short period of time, you can stock your pantry with 3-12 months worth of nonperishables and eliminate them from your grocery budget. This is how the most savings is realized because by doing this, you eliminate buying out of necessity – which is when you pay the most! The goal is to have enough on hand to get you through to the next rock bottom pricing, thus NEVER paying retail – or anything close to it! For example: if you have a stockpile of shampoo, you’ll be able to wait three months until it’s at its rock bottom price before buying more. In contrast, if you’re out of shampoo, you’ll gladly pay the shelf price for it, sale or not. Right now I have so much free deodorant, razors, shampoo, conditioner, styling products, toothpaste, toothbrushes, bar soap and body wash in my stockpile that I won’t even buy it unless I make money doing so (yes, it’s possible). This can be YOU in a few months time! For the most part, you’ll need to give up brand loyalty in order to maximize savings. Concentrate instead on matching coupons with sales and filling your cupboards with FREE STUFF! Before I started couponing, I was the worst about brand loyalty. It was one of the excuses I used for thumbing my nose at the whole coupon clipping thing. I liked what I liked. I wanted what I wanted. As the economy continued to nosedive however, my brand-snobbiness quickly withered away, and I have been very pleasantly surprised at the quality of items I have acquired. I have more skin care products, makeup, home fragrance items, candles, etc. than I ever had before. Good stuff. You know, the nice little “extras” that we often sacrifice when the budget is tight. I actually enjoy a better quality of life by taking what is free rather than staying in my old rut of brand loyalty. This will, of course vary by family. 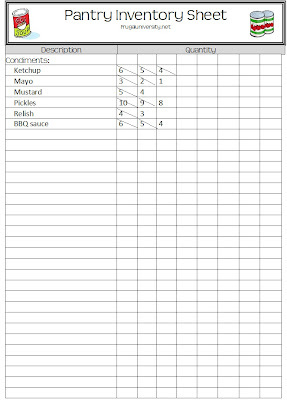 For me, I found it helpful to start by determining the twenty non-perishable food items my family consumes most often. Since my goal is a 3 month stockpile, I estimate how many I’ll need of each item and place it in parenthesis next to the item name on my inventory sheets. For example, my family of seven uses 4 jars of tomato sauce per week. I multiply that by 12 weeks and write “48” on my inventory sheet next to my tomato sauce entry. I begin by listing items by catagory so they’re easy to find. As items are added or used from my stockpile, I place a single line through the quantity and update the number in the next box. The box to the furthest right is always the current inventory amount (see below). 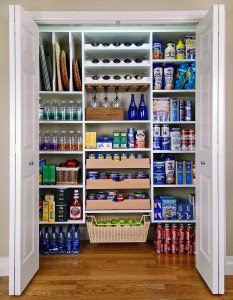 There are dozens of ways you can organize your stockpile. For me, I found it helpful to keep all toiletry and personal care items in a large linen closet near the bathrooms, while the rest of it is stored on shelves in the mudroom – which is near the kitchen. Think about where you’ll be using these items and where you can find the space. You may need to get creative. One thing to keep in mind is that your stockpile will always be evolving. You’ll have lots of extra hair products one month. The next month you’ll have a bit less, but lots more deodorant. Remember to be flexible and be prepared to quickly reorganize each month or so. November 5, 2008 7:10 pm By Lori Post contains sponsored/affiliate links and I get commissions for purchases made from links. As an Amazon Associate I earn from qualifying purchases. YMMV – your mileage may vary. Means all stores may not accept or participate. Catalina – coupons for $$ off your next purchase that print out alongside your receipt at the register. Stack – use two coupons together. For example, Walgreens allows you to use a Walgreens store coupon with a manufacturers coupon on the same item. Blinkies – sm coupon machines found in many stores that spit out coupons. They have a blinking light, hence the name. Hangtags – just what it sounds like. Coupon is on a tag that hangs from the product. Tearpads – just what it sounds like. Usually tearpad coupons hang on shelves near the product.